Mycoplasma bovis (M. bovis) is a major etiological agent of bovine mycoplasmosis around the world. Point-of-care testing in the field is lacking owing to the requirement for a simple, robust field applicable test that does not require professional laboratory equipment. The recombinase polymerase amplification (RPA) technique has become a promising isothermal DNA amplify assay for use in rapid and low-resource diagnostics. Here, a method for specific detection of M. bovis DNA was established, which was RPA combined with lateral flow dipstick (LFD). First, the analytical specificity and sensitivity of the RPA primer and LF-probe sets were evaluated. The assay successfully detected M. bovis DNA in 30 min at 39 °C, with detection limit of 20 copies per reaction, which it was compared the real-time quantitative PCR (qPCR) assay. This method was specific because it did not detect a selection of other bacterial pathogens in cattle. Both qPCR and RPA-LFD assays were used to detect M. bovis 442 field samples from 42 different dairy farms in Shandong Province of China, also the established RPA-LFD assay obtained 99.00% sensitivity, 95.61% specificity, and 0.902 kappa coefficient compared with the qPCR. To the author’s knowledge, this is the first report using an RPA-FLD assay to visualise and detect M. bovis. Comparative analysis with qPCR indicates the potential of this assay for rapid diagnosis of bovine mycoplasmosis in resource limited settings. Mycoplasma bovis (M. bovis) is a major etiological agent of bovine mycoplasmosis around the world. M. bovis has not only been confirmed as a major pathogen in bovine respiratory disease (BRD), but it has also causes disease in cattle of all ages, such as arthritis, otitis media, mastitis, and reproductive disorders . Due to lack of effectiveness of treatments for controlling the disease in affected herds and decreasing growth rate of the cattle, it can result in serious economic losses in both dairy and beef cattle herds . In 2008, a severe cattle respiratory disease was reported in Hubei Province of China, thereafter, it quickly spread to over 11 Chinese provinces. The organisms isolated from calf lungs were identified as M. bovis and designated strain Hubei-1. The 16S rRNA demonstrated 99.5% homology with M. bovis type strain PG45 . Other places in China, such as Ningxia, Xinjiang, Guizhou, Chongqing, and Qingdao, later reported M. bovis isolated from dairy cows and beef cattle . The lack of an effective control methods to prevent the rapid spread of M. bovis as well as its stubborn persistence on farms requires rapid and accurate diagnosis when clinical signs first appear . The development of simple and quick nucleic acid detection methods could greatly improve diagnostics; however, practical on-site testing is infrequently done due to the lack of availability of robustly tested methods. Detection of M. bovis from clinical samples by traditional culture methods is quite time-consuming and is often hampered by bacterial contamination. Although detection technology of molecular biology for nucleic acids, such as polymerase chain reaction (PCR) and real-time quantitative PCR (qPCR) has shown high sensitivity and specificity, these methods need professional diagnostic laboratories and thermal cycling device. Such facilities may be lacking in disease epidemic and poor areas, especially in developing countries, the use of rapid on-site diagnostic methods would be extraordinary helpful in controlling bovine mycoplasmosis. Recently, for DNA amplification, the recombinase polymerase amplification (RPA) technique has become a promising molecular technology for low-resource, rapid diagnostics . Several types of tests have been described , and the RPA combined with lateral flow dipstick (LFD) appears especially suitable for point-of-care diagnosis in clinical specimens. The RPA assay has been reported for the rapid detection of Caprine arthritis-encephalitis virus, Chlamydia trachomatis, Plasmodium falciparum and other pathogens [7–9]. However, the detection of M. bovis using RPA-LFD assay has not yet been reported. In this study, we developed a rapid, sensitive, and on-site RPA combined with a LFD assay for the specific detection of M. bovis in the field. The analytical specificity of seven primers combinations with LF-probes (Fig. 1 and Table 1) was confirmed using the genomic DNA extracted from M. bovis reference type strain PG45. The candidate primers for the RPA-LFD assay was screened with TwistAmp nfo reactions and preliminary analysis was performed on 2% agarose gel with labeled amplicons. The result showed that primer set uvrC-F1/uvrC-R/uvrC-LF probe yielded specific amplification efficiency for the RPA assay, and produced the expected size of the product of 281 base-pairs (Fig. 2a). The RPA-LFD test line appeared more quickly, within 5 min, and was more distinct than the other sets (Fig. 2b). This set (uvrC-F1/uvrC-R/uvrC-LF probe) was selected for subsequent evaluation (Fig. 1 and Table 1). The results showed that the RPA reaction could be determined at a wide range of temperatures from 30 to 45 °C. In addition, the test band was the brightest between 35 °C to 42 °C (Fig. 3a). Therefore, in the later the reaction of RPA-LFD assay temperature was set in 39 °C. Next, the optimum reaction time was estimated between 1 to 35 min. Results indicated that the most distinct band could be seen in the test zone position between 20 to 35 min with only weak bands seen after 10 min (Fig. 3b). According to the results, the incubation time was set at 30 min for the following RPA-LFD testing. RPA specificity was tested using various Mycoplasma species from cattle and other pathogens that cause respiratory disease and mastitis (Table 2). RPA-LFD revealed high specificity and no cross-reaction was observed against other Mycoplasmas (Mycoplasma agalactiae, Mycoplasma mycoides subsp. mycoides, Mycoplasma bovirhinis, Mycoplasma bovoculi, Mycoplasma bovigenitalium, Mycoplasma dispar, Mycoplasma canadense, Mycoplasma alkalescens, Mycoplasma canis, Mycoplasma arginini), respiratory bacterial pathogens (Pasteurella multocida, Mannheimia haemolytica, Trueperella pyogenes, Histophilus somni, Klebsiella pneumoniae) and mastitis or other pathogens (Staphylococcus aureus, Streptococcus agalactiae, Corynebacterium bovis, Pseudomonas aeruginosa, Proteus mirabilis, Enterobacter aerogenes, Brucella abortus, Escherichia coli) (Additional file 1: Figure S1). The sensitivity of RPA-LFD and qPCR assay was evaluated, and the repeatability test of limits of detection was showed in Table 3 and Fig. 4. Results from the testing of serially diluted plasmid DNA showed that RPA-LFD assay was capable of detecting 20 copies/reaction standards DNA, which was 4 times more sensitive than the qPCR assay (Fig. 4). RPA-LFD performance was analyzed using 442 clinical samples obtained from 42 different dairy farms in Shandong Province, China. The RPA-LFD and qPCR were executed in parallel. The RPA-LFD detected M. bovis DNA in 114 of 442 (25.79%) clinical samples while the qPCR assay found 100 (22.62%) of the same samples positive (Table 4). It indicated both assays were not significantly different using the independent-samples t test (P > 0.05). The established RPA-LFD assay yielded 99.00% sensitivity, 95.61% specificity, and 0.902 kappa coefficient with the qPCR (Table 5). Successful surveillance of bovine mycoplasmosis needs a rapid, specific and sensitive diagnostic method. The laboratory-based diagnosis techniques such as qPCR and enzyme linked immunosorbent assay (ELISA) are not able to meet the needs of a field test because the equipment required to perform them is not sufficiently portable or robust; furthermore some remote areas lack reliable power. With the development of isothermal nucleic acid amplification method, it is possible to perform on-site diagnostics in resource-limited settings. Here we established a new diagnostic assay based on RPA-LFD and evaluated its applicability to robustly and rapidly identify M. bovis, one of the crucial diseases affecting dairy and beef cattle herds in all over the world. Rapid diagnostic tests for infectious diseases ordinarily use nucleic acid amplification technologies. Molecular tests for M. bovis have been developed based on the unique DNA sequences of the uvrC and oppD/F genes . Subramaniam et al. (1998)  developed a PCR based on the DNA repair uvrC gene, which was shown to clearly differentiate between M. bovis and M. agalactiae. In this study, the analytical specificity of RPA primers and LF-probes based on uvrC and oppD/F gene was performed by agarose-gel electrophoresis. At the dSpacer position, when LF-probe is cleaved by nfo nuclease, the probe will be translated into a primer and act as priming for polymerase extension . The one amplified fragment is from the different F primers and common R primers, and the other amplified fragment is LF-probe and common R primers. Therefore, the common R primers give two bands. This paper describes a novel RPA-LFD assay based on LF-probe for M. bovis detection. Diagnostic specificity showed that the assay could detect reference type strain M. bovis PG45 and 4 others, but not other pathogens commonly found in cattle. Sensitivity revealed that the RPA-LFD assay was 4 times more sensitive than the qPCR method. To verify the diagnostic suitability of M. bovis RPA-LFD assay, the same clinical sample (n = 442) set was confirmed by the qPCR assay and yielded 0.902 kappa coefficient with the qPCR. For diagnostic purposes, several isothermal molecular amplification technologies have been developed in the recent decade . A comparison of 11 isothermal technologies indicates that RPA has some advantages over others. Firstly, RPA reaction is rapid, and nucleic acid amplification can be completed within 10–20 min. Secondly, it operates at lower temperatures (39 °C) than all comparable techniques with the exception of rolling cycle amplification (23 °C) . Several published studies have performed RPA using a simple heat source system. Lillis et al. (2014) demonstrated that incubation of the RPA HIV-1 assay via ambient temperatures or using chemical heaters yields similar results to using electrically powered devices . Moreover, the capacity of RPA to catalyze nucleic acid amplification using only body heat was also demonstrated . A water bath is sufficient to carry out the RPA-LFD testing in the field or in less well-equipped laboratories . Thirdly, commercial availability of freeze-dried reagents makes it easier operation in outside laboratory settings and in remote areas. Moreover, the RPA-LFD provides an easy to read visual signal for clinical point-of-care diagnosis. While PCR needs rapid and accurate temperature control during the amplification cycle, RPA can tolerates temperatures ranging from 35 to 42 °C without loss of reaction efficiency. This simplifies the instrument and reduces the cost . One disadvantage however is the current price of testing: in China, this is estimated to be ¥75 CNY (about 11 USD) for the RPA-LFD and about ¥15 CNY (2 USD) for the qPCR reaction. The RPA-LFD is a new technology and it is believed that the cost will become cheaper as it becomes more widely used. Further work is clearly necessary for this technology to be taken into the field including using body heat to activate the test and simplified DNA extraction possibly using NaOH DNA extraction . An RPA-LFD assay was developed for the rapid detection of M. bovis which will be suitable for on-farm testing and in particular in developing countries where sophisticated laboratory equipment is lacking. Its sensitivity and specificity were shown to be comparable to a previously published qPCR. Approximately 2–4 colonies of the reference type strain M. bovis PG45 were transferred into 200 μl of sterile PBS using sterile disposable loop. The genomic DNA was extracted and eluted in 100 μl of sterile water by using bacterial genome DNA extraction kit (Tiangen Biotech Co., Ltd., Beijing, China) according to the manufacturer’s instructions. Then, DNA was maintained at − 20 °C until screening of the RPA-LFD primer and LF-probe could be performed. The genomic DNA of clinical samples (nasal swabs, fresh lungs and joint fluids) was extracted using TIANamp genomic DNA kit and TIANamp swab DNA kit (Tiangen Biotech Co., Ltd., Beijing, China), specific steps carried out in accordance with the instruction book. The genomic DNA of bulk tank milk samples from the pellet was extracted using TIANamp genomic DNA kit according to reported in literature . The primers and LF-probe of the RPA reaction were used to amplify the uvrC gene (nucleotides 1464 to 1744 of the Genbank accession number: AF003959.1) and oppD-oppF gene (nucleotides 22 to 255 of the Genbank accession number: AF130119.1) sequences for M. bovis, and seven combinations of candidate primers (7 forward and 2 reverse) and two LF-probes were designed according to this two gene sequences. The details were shown in Fig. 1 and Table 1. The analytical specificity was performed using BLAST and no matches with other bacteria. Each 50 μl reaction volume was performed according to manufacturer’s instructions (TwistAmp nfo kit), and the volume of primer and LF-probe (10 μM) was adjusted accordingly. The following ingredients remained the same: 29.5 μl rehydration buffer, 2 μl DNA template, and 2.5 μl of 280 nM magnesium acetate. The test tubes were incubated at 39 °C for 25 min in a thermostatic water tank (Shanghai JingHong laboratory Co., Ltd., China). RPA amplification products were purified and the size of the RPA oligonucleotides was detected by 2% agarose-gel electrophoresis. Visualization of RPA amplicons was performed using LFD (HybriDetect, Milenia Biotec GmbH, Germany) according to manufacturer’s instructions. 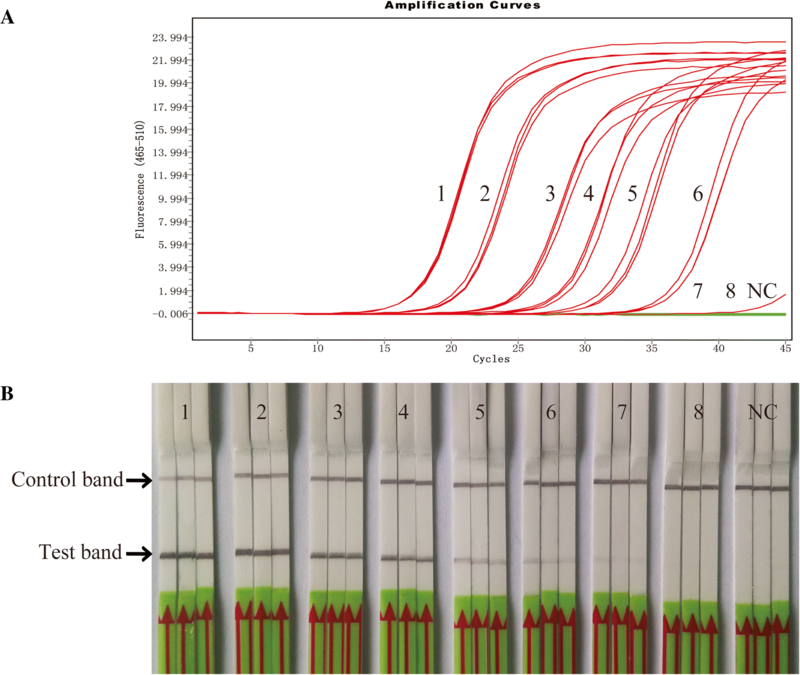 To achieve optimal primers and LF-probe, different combinations were analysed for specificity and sensitivity detection. Next, the incubated temperature and time of RPA reaction were assessed according to the reagent instruction (TwistDX); temperature ranges were 20 °C to 50 °C, and time range was 1 min to 35 min. The diagnostic specificity of RPA-LFD assay was confirmed with DNA from various reference bacteria strains and strains from clinical cases (Table 2). Most of bacteria species were supplied by BNCC using their recommended media. 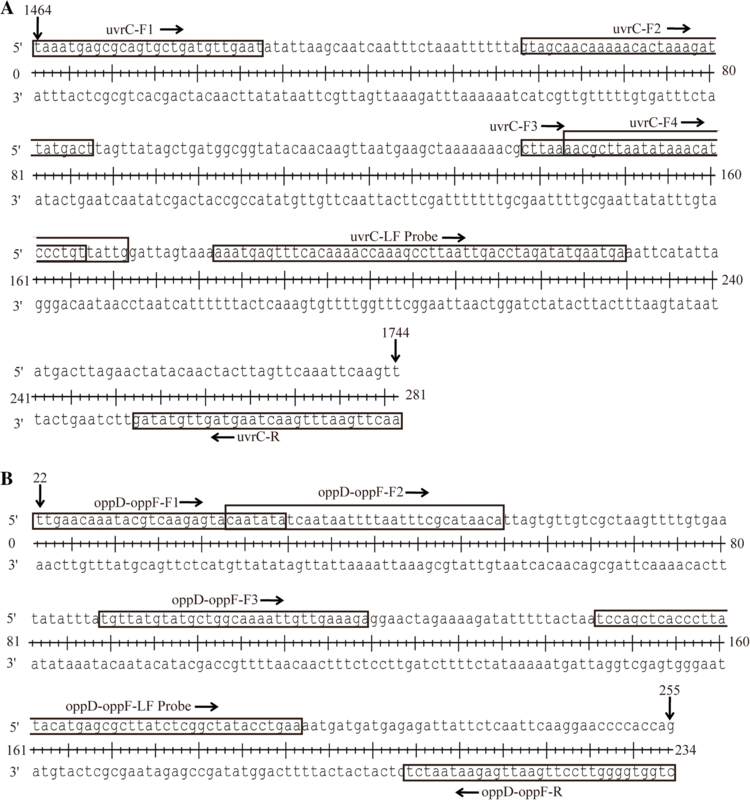 The forward primer (uvrC-F1): 5’-TAAATGAGCGCAGTGCTGATGTTGAAT-3′ and the reverse primer (uvrC-R2): 5’-AACTTGAATTTGAACTAAGTAGTTGTATAG-3′ were used to amplify 281 bp of the uvrC gene of M. bovis (1464–1744 of Genbank accession number AF003959.1). The amplified fragment was ligated into plasmid pEASY-T3 cloning vector (Beijing TransGen Biotech Co., Ltd., Beijing, China). The DNA copy number was calculated as described in literature . The analytical sensitivity of the RPA-LFD assay and qPCR assay was tested on standard plasmid DNA diluted in 10-fold serial steps from 107 to 1 copies/ul. For the RPA-LFD assay, in order to evaluate the repeatability limits of detection, the standard plasmid DNA dilutions were tested in duplicates, and this was repeated three times. The real-time qPCR assay for M. bovis was carried out to amplify a 170 bp sequences between 370 and 538 regions of urvC gene. The DNA molecular standard was prepared as previously described . The qPCR amplification condition were as previously described [25, 26]. Briefly, the reaction was prepared as a 20 μl reaction volume containing 2 × Probe qPCR Mix, 0.8 μl of each 25 μM Mb-F: 5’-CAAAAGCAAAATGTTAAATTCAGG-3′ and Mb-R: 5’-CATATATAAGTGAGACTAACTTATT-3′, 0.8 μl of 7.5 μM probe: 5’-FAM-CAAAAGCAAAATGTTAAATTCAGG-BHQ2–3′ and 2 μl of DNA template. The thermal cycling parameters were as previously described [25, 26]. Statistical analysis was performed using SPSS 16.0 software (Chicago, IL, USA); also independent-samples t test was used for evaluation of the results. For all analyses, P < 0.05 was considered significant. The diagnostic performance of the RPA-LFD and qPCR assays was assessed as described previously [27–29]. The kappa coefficient was defined as (Po − Pe)/(1 − Pe) . This work was partially supported by grants from the earmarked fund for the Taishan Scholar and Distinguished Experts (Hongbin He), the National Natural Science Fund of China (31872490, 31672556). Shandong province Key Research & Development program Fund (2018GNC113011, 2016GNC113006). HBH and GMZ conceived and designed the experiments. GMZ, PLH and YJH performed the experiments. HMW and CQH analyzed the data. GMZ and HBH wrote the paper. All the authors read and approved the final manuscript. Experimental protocols for acquiring cattle clinical samples were performed in strict accordance with the Chinese Regulations of Laboratory Animals (Ministry of Science and Technology of People’s Republic of China, 20,110,108), and the animal study proposal was approved by Shandong Normal University Animal Care and Use Committee (approval No. 20160901).